Jim tells Scott that he's going on a business trip, so will miss the farewell dinner for Bess. Scott says that Jim has to be there - it's "really serious". Jim is confused and asks Scott if there's something he hasn't told him - he's been behaving very strangely. Scott accuses Jim of hating Bess. Jim says that Bess has never changed her plans to suit his needs, and he's not going to change his for hers. Des and Daphne are having breakfast (rather like an old married couple!). Daphne says that she's going out tonight, so he'll have to cook for himself. She tells Des to go out and find a girlfriend, but he says he's happy just hanging out with Daphne. Daphne says that Des needs a romantic interest, not just a friend. Des says he doesn't want to get another room-mate - they can afford the rent with just the two of them. Daphne is pleased. Lucy is looking for a missing sock and ropes Scott in to help her. Just then, Bess comes into check on the plans for the farewell dinner. Basil has chewed up Lucy's sock, much to her dismay. Bess doesn't seem bothered that Jim won't be there tonight. When Helen and Lucy have gone, Scott asks Bess to let him tell Jim about her illness. She refuses. She says she'd like to talk to him honestly just once though. She says she worked hard to give Jim the things she never had as a child and she loves him. Scott thinks that Bess should tell Jim that she loves him. A new girl called Sarah is starting at the bank and it turns out she knows him. Apparently Sarah is his cousin. Des hasn't seen her in years and asks her not to tell people they are related, in case people think Des is giving her preferential treatment. Sarah doesn't look pleased. Helen is wishing Jim a good business trip. Before he goes, Jim rings Bess. He says it's been nice to see her again and tells her not to leave it so long next time. He says it's a shame that they didn't have more time to talk. They both hang up. Julie is showing Sarah a few things. 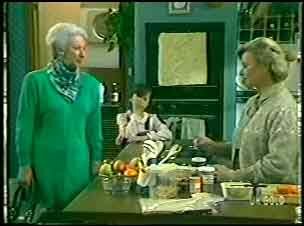 Des asks Sarah to come out for a quick bite to eat and Julie looks a bit taken-aback. The gossip-mongers start their work straight away! Jim is putting his things in his car. 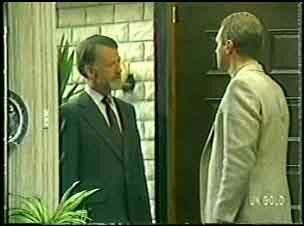 Bess rings Jim's number, but he misses the call because he doesn't get into the house in time. Just then, Edward comes to the door at the Robinsons. He's looking for Bess. He tells Jim that he's very good friends with his mother. He's got some papers for Bess to sign that he forgot about "in the shock". EDWARD: I wouldn't normally call personally, but I was hoping to see her again...just once more, you understand. I'm goingt o miss her so much. JIM: Yes, we all will. EDWARD: Must be a terrible shock to the family. I believe your son Scott's taking the news very hard. Yes, we'll all miss her. I still can't quite believe that all that life and energy is disappearing. I thought she'd live forever. EDWARD: Her illness. Surely she told you about it? Didn't she? 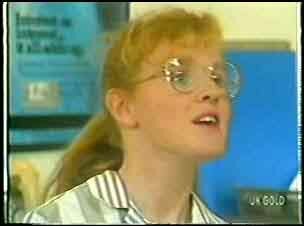 Sarah tells Des that she is having trouble finding somewhere to live. 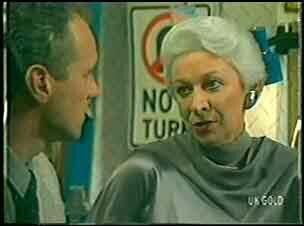 She's surprised to hear that Des has his own house, and looks disapproving when she hears that Daphne is his lodger. Julie starts to test Sarah on what she's taught her about bank procedures. She has to serve the next customer. Daphne is next, but Shane is also there and Sarah calls him over first. Scott is still in a bad mood about Bess. Lucy says it could be puberty(!) Then she asks Helen what puberty is! LUCY: Do I have it? Lucy shows Scott the card she's made for Bess. Scott is upset that Jim isn't there. Helen warns him not to let his bad mood spoil Bess's farewell. Marilyn invites Sarah for a coffee, but Des is giving her a lift. 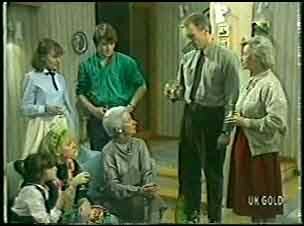 The family are gathered and Lucy gives Bess her card. Julie gives her some flowers. Terry thanks Bess for all her advice with Paul. Scott and Bess go off to his room for a quiet word. Bess tells Scott that she's failed him. Jim rang to say goodbye, but she couldn't get the words out to tell him she loved him. She tried to ring back, but it was too late. Now she has a regret, and she's never had one in her life before. In the living room, Jim comes in unexpectedly. He goes through to Scott's bedroom to see Bess. Jim asks Scott for a few moments alone with Bess. JIM: Why didn't you tell me? Jim explains that her friend Edward told her this afternoon. 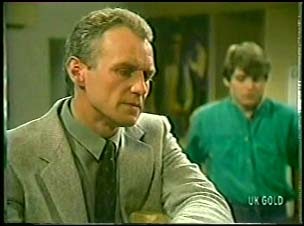 He wants to know why Bess didn't tell him she was ill.
Bess tells Jim that Scott loves him a lot. She never meant to fail Jim. 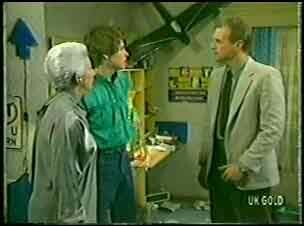 Jim asks Bess to stay so they can look after her. BESS: Let me do it my way. Please, Jim. I'm not dying - I'm living. Jim says he's terribly sorry for the things he said the other night. They both admit that they've been selfish. BESS: Jim, I want to tell you something that I shoudl have told you years ago. I just assumed, took it for granted, that you knew. BESS: I love you, Jim. I'm sorry I haven't told you before, I just didn't know how. JIM: Mum, I love you too. BESS: Well, we're both OK then, aren't we! Later in the living room, everyone has a glass of champagne. JIM: To my mother. One of the finest women I've been privileged to know. Just then, Bess's taxi arrives. 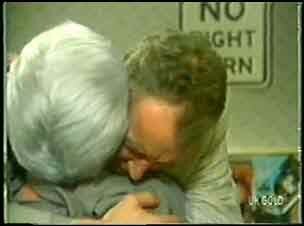 Jim and Bess hug goodbye and he holds back tears. Then she hugs Scott who is also tearful. SCOTT: You know, don't you? Scott explains that he promised not to say anything. Jim says that there were lots of good times with Bess, he just concentrated on the bad ones. He tells Scott that he'd forgotten what a wonderful woman Bess was. He hopes that never happens between him and Scott. Daphne is wandering around in the dark during the night. She bumps into a woman, who screams loudly.